The Target Baby Box Rocks My Socks. I love the Target Baby Box ($7.41 with tax). I really appreciate the ability to try out baby products without a huge investment. Ok, I MOSTLY appreciate getting a package of fun little travel size products in the mail for less than $10, but I like the trying them out thing second best. Or maybe third best. I like getting mail, I like having little cute bottles to tote around, and I like being able to try out the products without a huge investment. Oh, and I also like looking at the pretty gold box all wrapped up like a present, and I like that the $10 coupon that is included that makes it basically free. MORE than free, actually. I would be silly NOT to buy the baby box. Plus, of course, I get the opportunity to try out new baby brands or products that I otherwise might not have purchased. The most recent Target Baby Box came with $20.54 of baby things. I know this because one of my brilliant college student children did the math. Check out the breakdown. PLUS the Baby Box included a ‘$10 off of $50’ Target baby coupon. Do you know how easy it is to spend $50 in the baby section at Target? So easy. So so so easy. So basically, the Baby Box is free even if I don’t use any of the cute miniature products. Because the truth is, I’m not going to use all of these products. I will give some away, like the Avent pacifier and the Triple Paste rash ointment. They are fine, I just don’t use them. I will use some right away, like the Method laundry detergent and Honest Company hand sanitizer spray. That 30-pack of Seventh Generation wipes is currently in my diaper bag. I will save the Mustela lotion to try after further research. And I will likely toss some immediately. We already know that the grown-up versions of Cetaphil and Dove contain some very suspicious ingredients, and so far I assume the same is true of the baby versions. But did I mention that the Target Baby Box has POLKA DOTS!? Ok, we all know that I mean sunscreen but does ANY TODDLER like having sunscreen applied? Maybe it just needs a new name? Funscreen. Like when I call bathtime, splashtime. No? 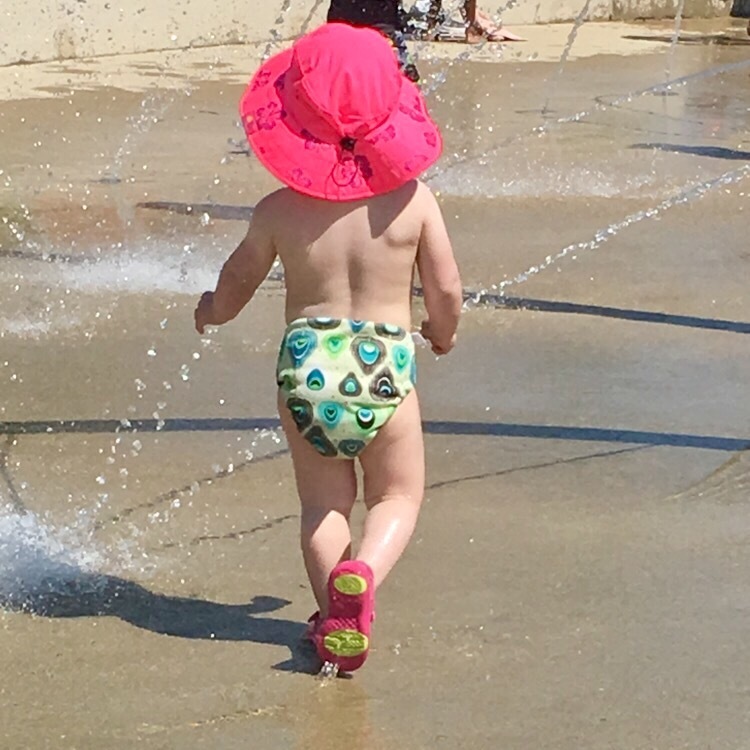 MAYDAY MAYDAY: Does anyone have any ideas on how to apply sunscreen to a wiggly ToddlerMonster in a fun, laughter-filled manner? Or at least in a way that gets full coverage with zero tears? I ordered the Target Baby Box last April ($5) with some great intentions of reviewing products for all of you wonderful people that take the time to read my little blog. I wanted to give something back to you, even if that something is just more of my opinions. I did not do that. Mostly because I’m lazy. But I did discover a wonderful baby sunscreen through that Baby Box so it was totally worth it. 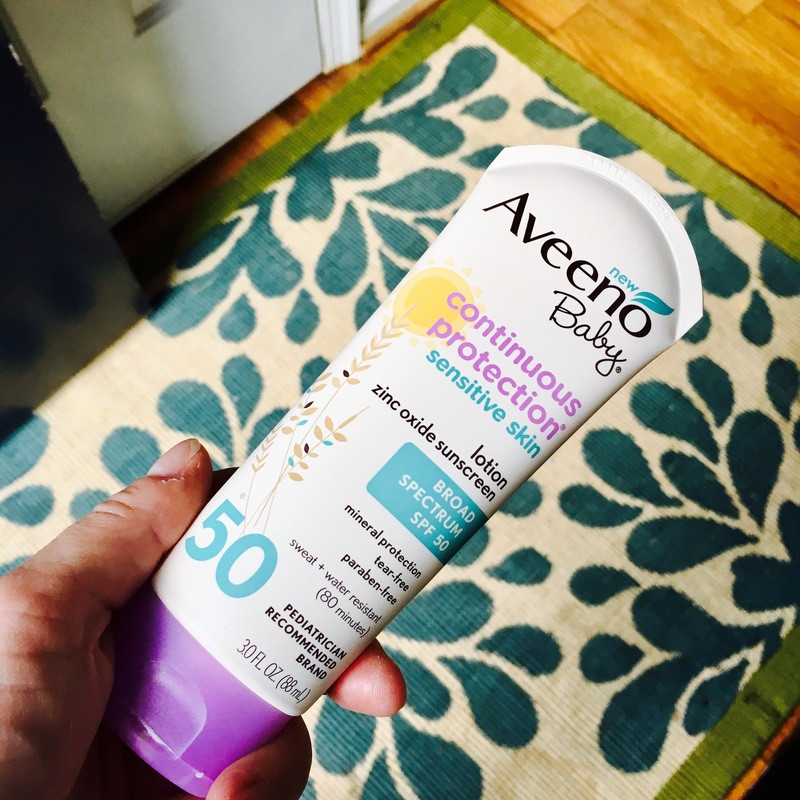 I highly recommend the Aveeno Baby Continuous Protection Sensitive Skin Lotion Zinc Oxide Sunscreen SPF 50. I have read a lot of scary articles this past spring about all of the poisonous crap in a lot of sunscreens out there in the world. I even found out that my SPF 15 face lotion was most likely going to kill me. MAYDAY MAYDAY: Does anyone have and love a grownup face moisturizer with an SPF of at least 15? I used the entire tiny bottle of Aveeno Sunscreen that came in the Target Baby Box and just recently had to replenish ($10.49). It goes on not-too-thick and it’s not at all greasy, but it definitely works. We have been in the sun quite a bit this summer and my little pale blond super white ghost baby has not had a single sunburn. Babystar is the whitest little marshmallow ever, so this stuff is legit!